Tropical Buckeye (Junonia genoveva) butterflies range from the southwestern United States and southern Florida down through Mexico and Central America to South America. 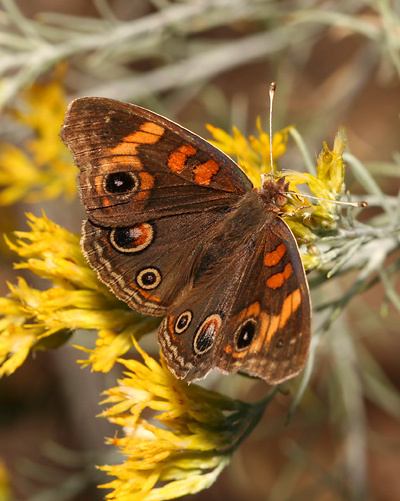 Tropical Buckeye butterflies are found throughout much of Arizona, including here in the southeastern portion of the state. I observed these Tropical Buckeyes in early November, 2007 in St. David, Arizona along the San Pedro River. 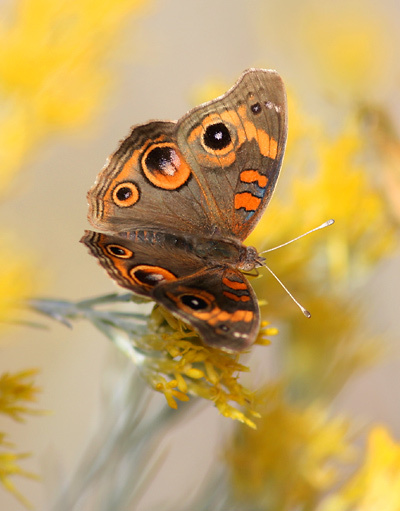 Autumn is actually a great time to observe butterflies here in southeastern Arizona because they are still quite numerous, but there are fewer wildflowers for them, so any remaining late-season butterfly wildflowers will be absolutely covered with butterflies at this time of year. Of course, this all changes with the first frost, which usually arrives here in late November. Tropical Buckeye butterflies are a rich reddish brown color with two black-edged, orange cell bars and two black eyespots (one tiny and hard to see) on each dorsal forewing and two black eyespots on each dorsal hindwing. 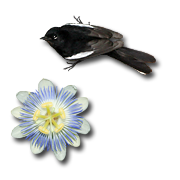 The ventral forewings each have an eyespot, but the ventral hindwings are a plain, tan-colored brown. The Tropical Buckeye's large eye-spots are a defense against predators like birds that can be startled or momentarily frightened away by the sudden, unexpected appearance of large, owl-like eyes on a butterfly's wings. Many owls are predators of other birds, and birds rightfully fear them. Even though they aren't the most owl-like in their number, the Tropical Buckeye's many large eyespots may make it look even more strange and alarming to birds. The Tropical Buckeye is very similar to the Common Buckeye (Junonia coenia) but the Tropical Buckeye has reddish brown wings and an orange-cream, warm tan, or orange band across the tip of its forewings, while the Common Buckeye has gray-brown wings and a yellowish cream to white forewing band. All of the Tropical Buckeye butterflies that I've seen here in the Sonoran Desert have bright orange forewing bands, which makes them easy to distinguish from Common Buckeye butterflies.